With the Solstice on our minds, Handsome Timmo and I had a wander up to the Sleddale Stone Circle on Wayworth Moor. It’s probably the only true stone circle on the North York Moors, there are other rings of stone on the moors but these have mostly been either classified as ring cairns or are so ruinous that an accurate interpretation cannot be made. Aubrey Burl writes, Only Commondale on a gentle slope may be a genuine oval. 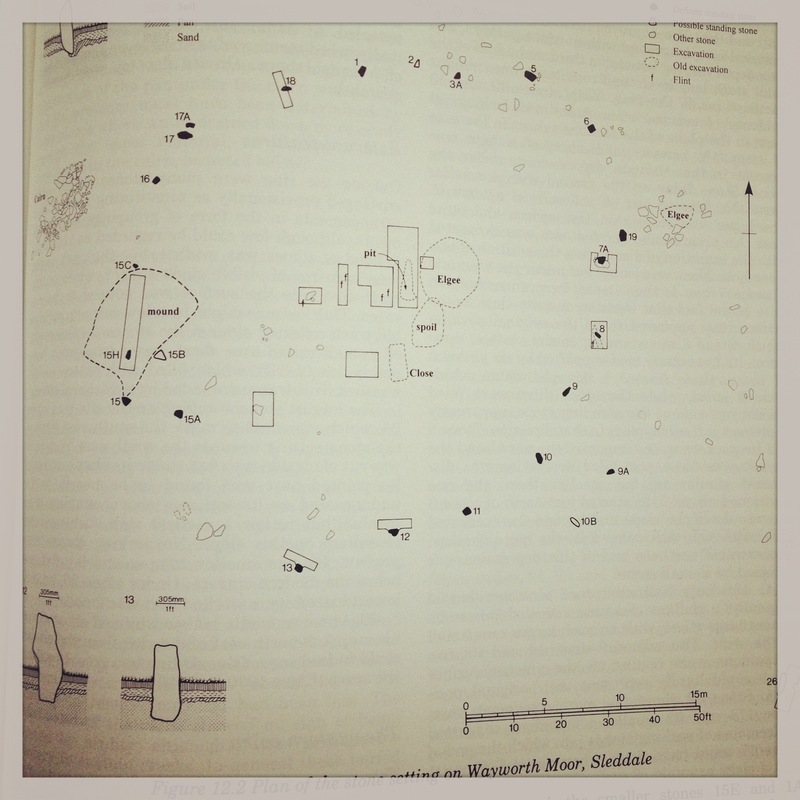 In 1967 Don Spratt and the Teesside Archaeological Society surveyed and selectively excavated the site and recovered a number of artefacts. They noted sporadic groupings of sandsone fragments and a regular sprinking of quartz-like particles up to 6mm long: this layer was also several inches thick. In Bill Pearson’s final report of the work he states that, The regularity and density of the white crystals in the soil make the idea of a ceremonial sprinkling attractive; the spreading of quartz crystals for ritual purposes was a regular occurrence in prehistory. I first became aware of the circle in the mid 1980’s after seeing an aerial photograph of it in Richard Crosthwaites book, Ancient Cleveland From The Air, it took a couple of visits to locate it. The circle is on sloping ground on Wayworth Moor, the easiest way to approach is along the keeper’s track that runs from the Commondale to Kildale road, just opposite Wayworth Farm. Whiteley Crag overlooks the circle, the land to the west of the stones drops steeply down to the Sleddale Beck, a major tributary to the River Esk. The circle is surrounded by moorland, but once at the circle the eye is drawn through the U-shaped upper valley of the Leven and then out onto the North Scarp of the Cleveland Hills with, on a clear day, the Pennines visible in the distance. The peak of Roseberry Topping is also visible, cutting the horizon to the north west of the circle. 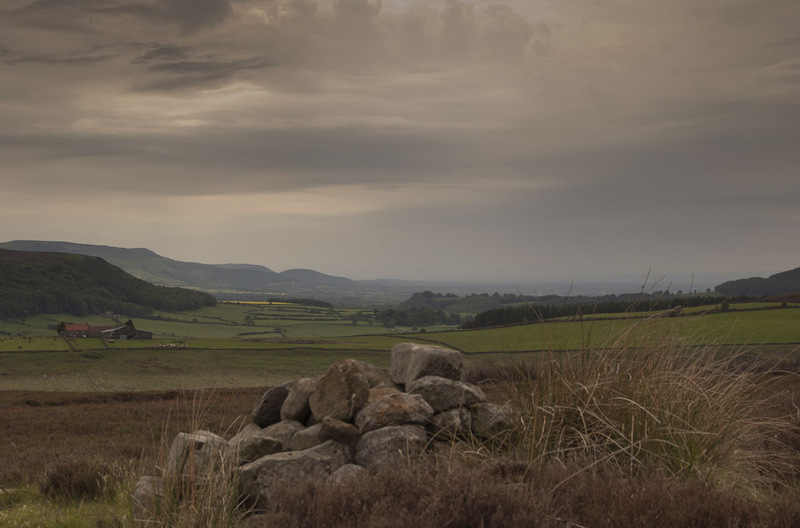 This area is riddled with prehistoric sites, the moorland around the circle is dotted with cairns, the beautiful, stone-faced cross ridge dyke, the Bridestones, is just a mile or so away to the north east. 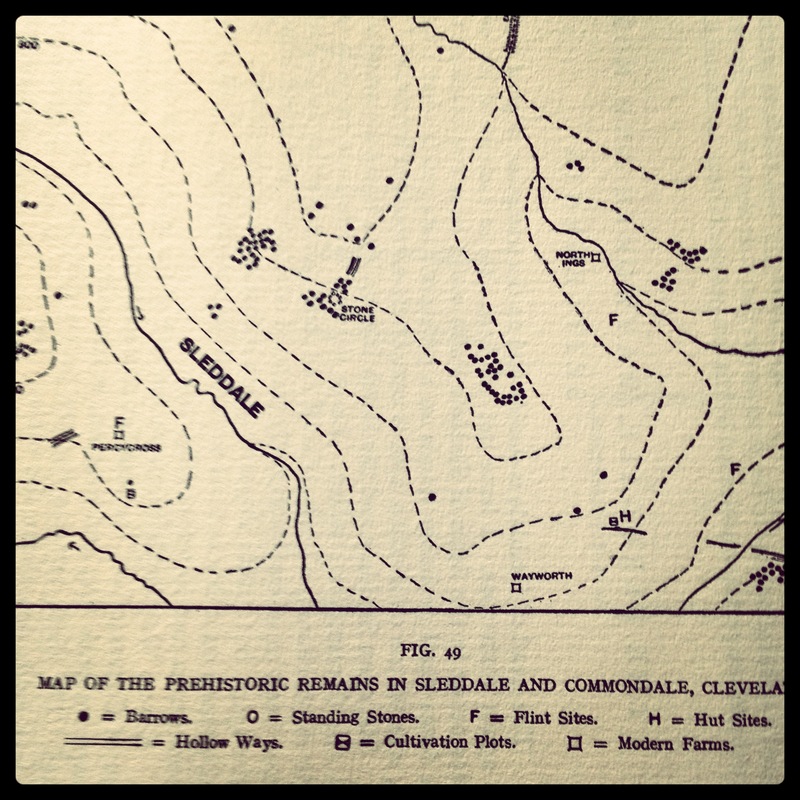 JW Ord wrote on the country surrounding Commondale; Some forsaken, ruined cottages add to the desolation of the scene; and a few tumuli, broken crosses, druidical stones, and scattered cairns, peopling the lonely moors, recall visions of former ages and evoke in the mists of morning or evening grey heroes and venerable forms, such as Ossian would have loved to picture. Wayworth Moor is a managed grouse moor. I’ve met the keeper up there a couple of times, he’s always polite and friendly but in common with most keepers, he has an underlying air of suspicion of strangers, nothing wrong with that. Whilst we were up there we came across a number of groups of grouse chicks being urgently shepherded away from the path by a frantic hen. We were also constantly shadowed by pee-witting lapwings and a couple of curlews who undoubtably had nests nearby. To me the shrill, lonely cry of the curlew is the sound of the moors. We kept the terrier on a short lead throughout our traipse, a free running dog could cause untold damage to the ground nesting birds at this time of the year. I have mixed feelings about grouse moors, I love them but recognise that they are not wilderness, they are managed, artificial habitats where the rearing and shooting of grouse takes priority. 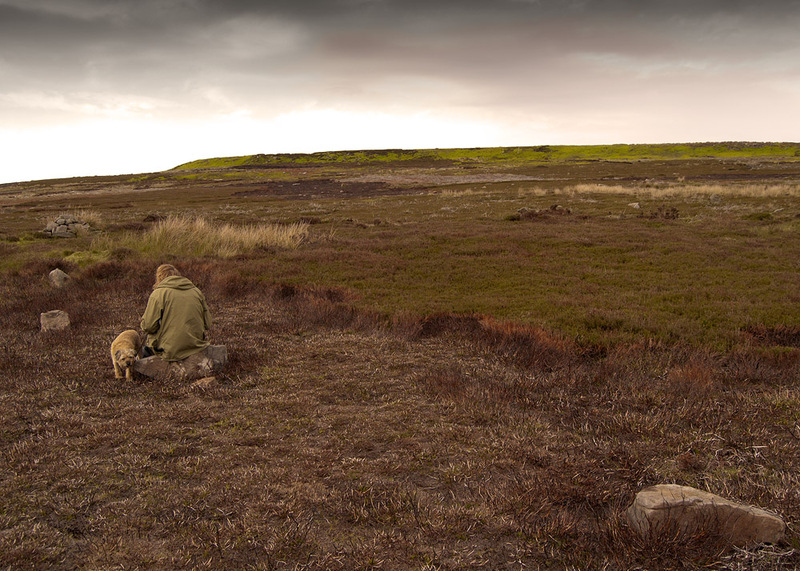 The grouse have to be carefully nurtured, they need short heather for feeding and long heather for nesting and cover, hence the regular burning of the moors. Burning improves the habitat for the grouse but prevents some plants and trees from establishing themselves on the moors. Trees and shrubs tend to be confined to the marginal areas where the burning of the heather is of no value to the keepers. 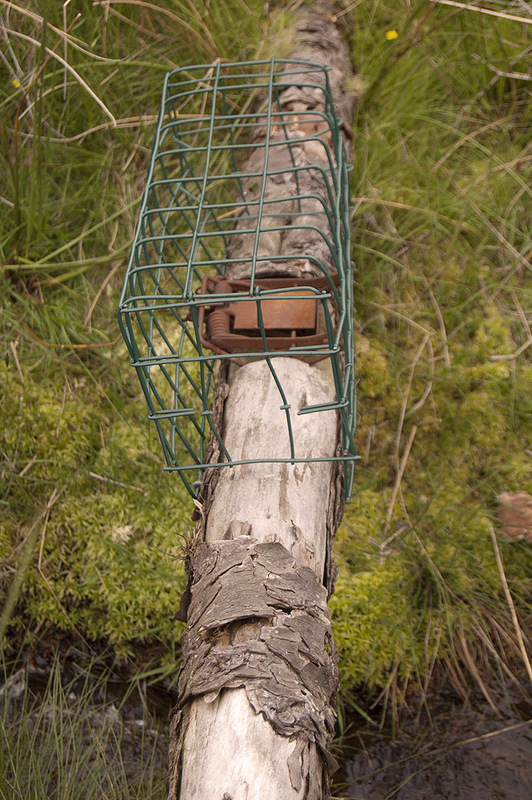 The grouse need to be supplied with regular rations of grit and water and all predators are eliminated. 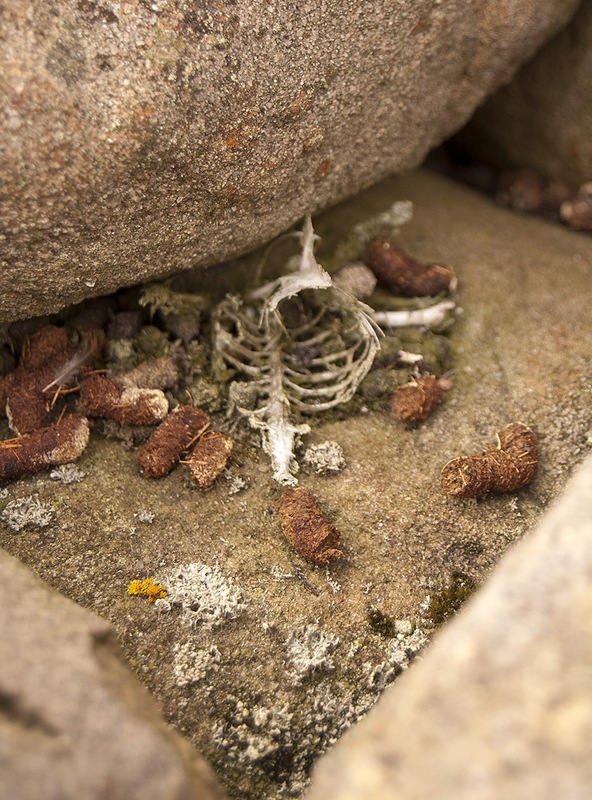 I have never seen a hawk or owl whilst walking on a grouse moor and stoats and weasels are a very rare site. In his 1979 book, The North York Moors, Stanhope White described the moors as a man made desert, man made in the sense that it was our distant ancestors who destroyed the natural cover and allowed the growth of bog and heather to give the largest heather moor in England. I agree with White but that if the moors were managed differently they could become a far more diverse habitat. An example of this is Fylingdales Moor where in 2003 a large fire devastated the moor. Following the fire, the management of the moor was handed over to the Hawk and Owl trust. 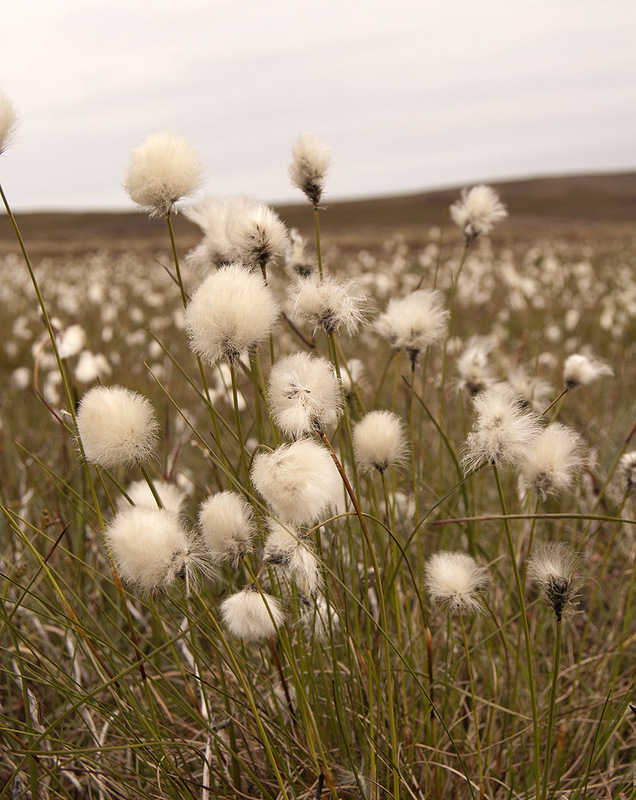 Today Fylingdales Moor is anything but a desert, small trees have become established and the wildlife is flourishing. I recognise that the grouse estates provide employment and inject cash into the local economy. The estates also manage the moorland and provide much needed access to these beautiful places. In his book, Stanhope White discussed the deep ploughing of the moors to break-up the iron pan therefore improving the moors and allowing larger areas to be turned over to agriculture. White’s idea was driven by the need to produce more food to feed the nation, it’s difficult to argue against that, but the fact that his plan was never implemented has meant that the ecology and archeological remains on the moors have remained relatively undisturbed, leaving much yet to be discovered. 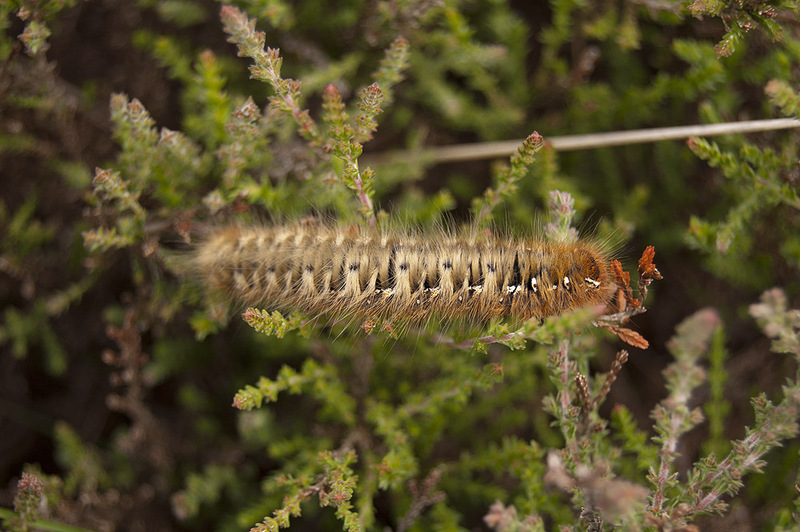 An Oak Eggar Caterpillar found within the circle. Wayworth would be more properly Waywath, a Norse Name denoting a ford. Conn seems to be Irish cone, a corner, an angle, a meeting. Conn House stands close to the junction of the Sleddale Beck and the Esk. The twelfth century name for Commondale was Colman Ergos or Argos. Ekwall regards Colman as a Gaelic personal name. Esk, British isca, water; old Welsh uisg. This Post was posted in Archaeology, North York Moors, Prehistoric, Stone Circle, Wayworth Moor. Bookmark the permalink.